Abud (also known as Aboud )is a Palestinian village in the Ramallah and Al-Bireh Governorate in the central West Bank of the Palestinian territories, about 22 kilometers northwest of Ramallah and 30 kilometers north of Jerusalem.It has a population of just over 2000 people, of which about half are Christian. Unemployment levels are high and ongoing conflicts can make life very difficult.The school seeks to provide a loving and caring education to the village children , and receives regular help and financial assistance from the Hope Christian Trust. The headteacher and the children using Kindles during lessons.The trust has helped fund this project. 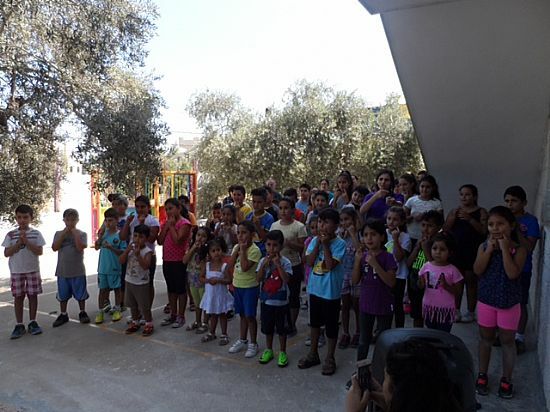 See below a picture of the children praying with the headmistress of Abud school.